I'm back from my Grand Canyon rafting trip and can honestly say I had the best time of my life. I learned to camp, row a river raft, and a lot about myself. I even rowed a class 3 rapid! It was a lot of work being on the river, but the simplicity that came from letting go of modern life and truly relaxing made the experience just extraordinary. It didn't hurt that the Canyon is just so incredibly beautiful either. There's so many stories, so many things I want to tell you all about, but I'll save that for another post when I have the photos organized and ready to share. Until then, let's get to back to business, shall we? On to the cupcakes! A few weeks before I left for my trip I received an email from a reader, Jennie, asking me if I had ever heard of Buster Brown Cake. She didn't provide a recipe so I hopped onto Google and found one on Midwest Living Magazine's website. I wasn't super impressed at first because it looked like just another brown sugar butter cake, but the frosting piqued my curiosity. It starts with making a roux like substance out of milk and flour that is slowly brought to a boil and let sit in the fridge for two hours. I wondered what a frosting made with flour would taste like? Would its texture be thick and pasty? I wasn't able to read the article that accompanied the recipe, so I know nothing of its origin; but my guess is that it is probably linked to the Buster Brown comic strip that was popular during the early 1900s. Maybe it was the winning recipe for a contest? Whatever the impetus was, this recipe is a keeper! I loved the tender crumb of the cake and its lovely butterscotchy-caramel flavor. And the frosting, wow! It lived up to its namesake because it really was delicious. I mean really, really good! 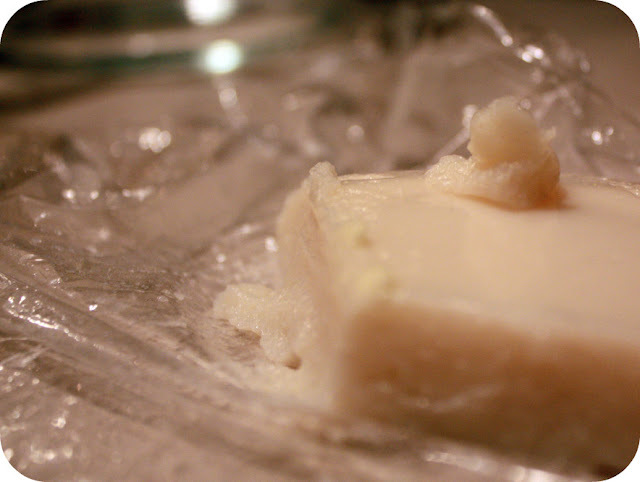 It has the most wonderful creamy texture that was light and had the perfect amount of sweetness. And as an added bonus it was very stable and held its shape. 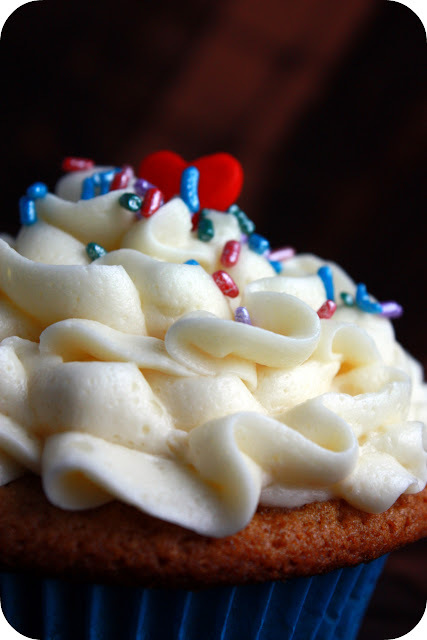 This frosting has a lot of different names and is sometimes referred to as "Butter Roux", "Cooked Vanilla Frosting", "Flutter Cream" or "Flour Frosting"; call it what you want, but I just call it delicious! The day after I received the email from the reader about the Buster Brown cake, I was contacted by Jennifer from Singing Dog Vanilla. She had graciously offered to send me a sample of their organic pure vanilla extract. What perfect timing! I have to say that I was just blown away by this vanilla and I've tried a lot of vanilla extracts over the years. There's no added sugar or fructose - just water, organic alcohol, and organic vanilla beans so you're left with a very true vanilla flavor. Jennifer was kind enough to offer one of my lucky readers their choice of organic vanilla extract, vanilla bean paste, vanilla beans, organic ground cinnamon, or cinnamon sticks. How cool is that?! Considering how good their vanilla is, I can't wait to try their cinnamon. Preheat oven to 350F. Line a muffin pan with 18 cupcake liners and set the pan aside. In a medium bowl stir together the flour, baking soda, and salt; set aside. In a large mixing bowl beat shortening with an electric mixer on medium to high speed for 30 seconds. Add brown sugar and vanilla; beat for 2 minutes. Add egg yolks 1 at a time, beating for 1 minute each. Alternately add flour mixture and buttermilk to shortening mixture, beating on low speed after each addition just until combined. In a medium mixing bowl beat egg whites with an electric mixer on medium speed until stiff peaks form (tips stand straight). Gently fold egg whites into the beaten mixture. Fill each cupcake liner a little more than half-full. Bake for 15 to 20 minutes or until a wooden toothpick inserted near the center comes out clean (if a few crumbs stick to the toothpick, it's okay). Let the cupcakes sit in the pan for 5 minutes before cooling thoroughly on wire racks. In a large mixing bowl beat butter, sugar, salt and vanilla with an electric mixer on medium speed for 5 minutes. Add the chilled milk and flour mixture, 1/4 at a time, beating on medium speed after each addition until smooth. Let it sit in the fridge for about 20 minutes to thicken. Makes about 3 1/4 cups frosting. 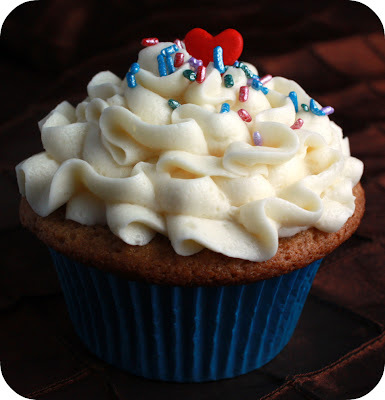 When the cupcakes are completely cooled, frost each cupcake with a generous amount of frosting and enjoy! Love the cupcakes, and especially how you frosted them. Very cute! And that vanilla sounds amazing. I recently tried making vanilla extract at home by steeping three split vanilla beans in a cup of vodka for two months. I was pleased with the result but not blown away by the vanilla flavor. Perhaps it was the beans I used. So I'd love to try this woman's vanilla extract! I love that frosting! We've always called it "whipped cream frosting" (don't know why) and use it on champagne cake. Your cupcakes look delicious. I think I'll try them this weekend! you really have an art for decorating.... it looks beautiful! That is one beautiful cupcake! What an interesting frosting. I'd have been really doubtful too, but it looks perfect. I'm going to have to give it a try. The cupcakes look delicious and I have never seen frosting made that way so I'm looking forward to trying it. And who doesn't love vanilla - especially when it's free! Lovely cupcakes. 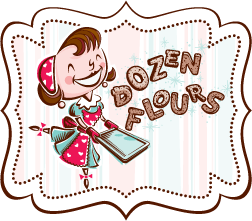 I've made flour based frosting before and enjoyed it. I reminded me of Cream of Wheat. Your photos are great! I like how the cupcake is highlighted and the background muted. Ooh, I think that frosting would have made me really anxious! I'm glad it worked out, now I'm almost thinking about trying it! And thanks for the chance to win! Wow, that's worth a try. And it looks like it wouldn't be too sweet! The cupcakes both look and sound scrumptious. I would love to win some vanilla bean paste. I am a tru amateur baker and I've only read about using it. This would be the push I need to try it out. I would love to win some vanilla extract! Those cupcakes look amazing! I made a cake once that called for a frosting similar to this. But it said cook til thick and I thought I had but it was so runny in the end. Apparently you're supposed to cook it down til it's a lump of dough not thick like gravy :-( All the powdered sugar in my pantry couldn't save it. I've never heard of putting flour in frosting! So interesting. The frosting recipe looks interesting. I've been looking for new cupcake recipes so I'll definitely have to try this one! welcome back! i'm a big fan a vanilla & just switched over to trying to bake with all natural products (as much as i can) so i'm really excited for this giveaway! So glad to see you back up and that you had a good trip. Those cupcakes look amazing...I usually don't like a lot of frosting on my cupcakes, but I can tell that frosting is the exception! That vanilla sounds amazing too! I am intrigued by the recipe here as well as what one can do with a vanilla bean paste. let the baking season begin!!!! they look delicious. I SO need to learn how to decoratively put frosting on cupcakes..the frosting ALWAYS make the cupcake! i've always wanted to try vanilla bean paste! That frosting looks good enough to eat! LOL. I love vanilla...yummo! the cupcakes are adorable and they sound amazing! i will be making these soon! thanks for the recipe! That is definetely a frosting I would like to try to make. Your cupcakes were too cute! And this is the perfect time of year for vanilla..I start baking like crazy now! I would love vanilla bean paste or vanilla beans. Thanks for the giveaway! The cupcakes look great. Thanks for the chance to win some great new products that I can't wait to try!! Yes, please enter me in the giveaway! I'd love to try out some new goodies! I'm so glad you're back. I was checking weekly to be dissappointed a lot. Thanks for the return, a great recipe, and a giveaway! I'd love to win vanilla beans! I've been thinking about rafting in the Grand Canyon too, and you've completely sold me on the idea! Just made some brown butter frosting a few weeks ago (different recipe). I'll have to compare them! These sound super yummy! And that vanilla sounds fabulous, too! I have a recipe for the flour frosting but haven't had a chance to try it out. I love the way it "holds up" on a cupcake. Thaanks for the giveaway and welcome home! Mmmm! 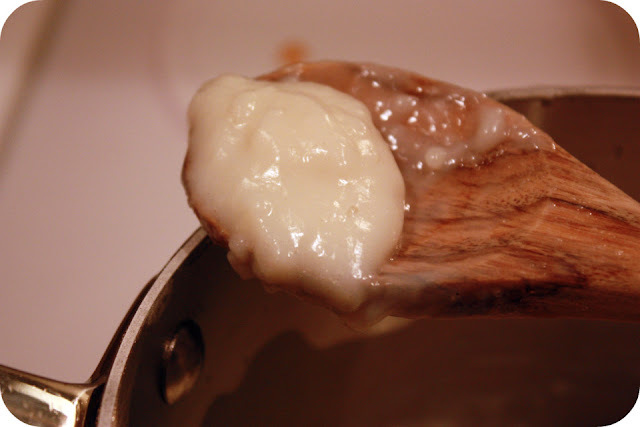 Vanilla Bean Paste. Pick me! Pick me! YUM! Those cupcakes look delicious. I could use some vanilla extract or paste for the holiay baking season! What an awesome giveaway...I'd love to try some of the vanilla paste, and cinnamon is always good! This frosting recipe is in a Homemakers Cookbook I've used for years..it's with a Red Velvet Cake Recipe..it's the only frosting I use for Red Velvet. Hey, that's the frosting I use on my Granny's red velvet cake recipe. She always called it white sauce icing. I've never seen the recipe in print anywhere else! How cool!!! I keep hearing such wonderful things about vanilla bean paste, I'd love to try it!! Glad you had a wonderful trip!!! What tip size did up use for piping on the frosting???? Too cute! Your Buster Brown cupcakes look delightful, especially the frosting. I have made a vanilla icing similar to that before and ever since I first made it, I have people requesting it all the time. It's a lot less sweet than your typical American buttercream. Your piping method is also very attractive. I will have to try that look next time. These look wonderful. Great giveaway - who doesn't love vanilla? I'm glad you're back! I've been checking regularly and look forward to hearing about the amazing trip. I was just thinking about your blog today and wondering when you would be back! I love the way you decorated the cupcakes. My husband recently became a US citizen and we could have used these cupcakes! i would love the chance to try some really good vanilla. I am in need of some vanilla beans! But they are so darn expensive! Thanks for the giveaway! Vanilla bean paste!!!!! I've never tried it, this would be awesome!!! I love the flavor of vanilla - but have never tried using actual vanilla beans - would love to! Welcome back from vacation - I've missed your posts! Incredible cupcakes - I am going to have to try these. Seeing as I love all things cinnamon, it would be a great experience to try the organic cinnamon! I wonder what the history behind the frosting is? Based on the comments, it seems to have been more popular during the mid-twentieth century and earlier? Does it use less sugar or butter per ounce? If so, perhaps it was developed in order to stretch ingredients during periods or rationing? I'd never heard of an icing with this set of ingredients or process before. I've made a similar frosting with a recipe from the Our Best Bites blog. It was AWESOME! I was also skeptical of the method but it turned out great. Your cupcakes look amazing and I would love to try out the vanilla extract. The vanilla paste sounds intriguing but I don't know how to use it! Hope your trip to the Grand Canyon was wonderful. It is such a beautiful trip. Would love to try that vanilla! Wow, who woulda thunk a cooked flour-milk contraption would make a delicous and creamy frosting? I'm going to have to try both the cake and the frosting. Beautifully decorated cupcakes, and welcome back!! The frosting looks so yummy! 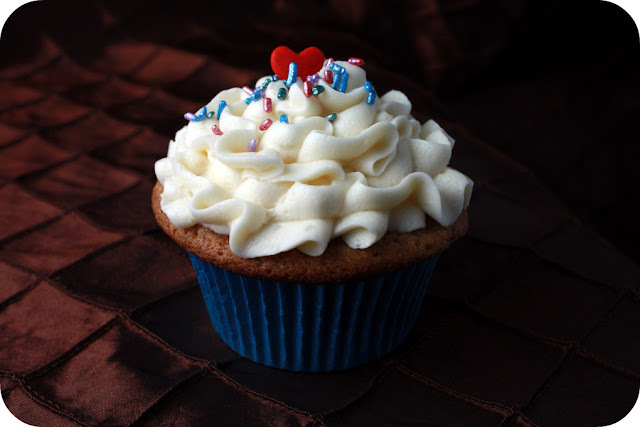 Do you have any suggestions for other cupcake recipes it could go with, if I wanted to mix things up a bit? Also, I would love to be entered for the giveaway! The vanilla sounds wonderful! mmmm-i'm out of vanilla paste-need to get more for the holidays. would love to try singing dogs! I'm very curious to try this frosting recipe. and organic vanilla -- count me in! The frosting seems a bit overwhelming, but looks beautiful (and yummy)! Your cupcakes look so delicious!! I'll definitely have to try the recipe soon. Thanks for the giveaway!! Hmm I'm going to have to try that frosting. And I'm looking forward to the cheesecake reipe...I'm an avid follower of the religion of cheesecake :) and am always questing for the perfect cheesecake! What a great give-a-way! AND, the cupcakes are too cute! What a gift you have. The frosting recipe is one my Mom made all the time. It is an old favorite. Thanks for the reminder! I really enjoy reading your blog. Those cupcakes look delicious! I would love to win some organic vanilla! Wow the rafting trip sounds amazing! I want to take my husband one day on a trip like that. The intense feeling of the rapids ... wow.. The frosting sounds great! Definitely going to try it. I would love to have some good vanilla or vanilla bean paste. I've been wanting to try that. 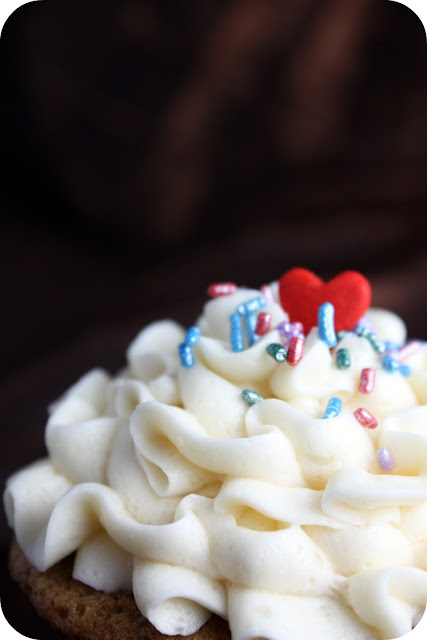 I made this frosting this week and fell in L-O-V-E! I honestly think this is my favorite vanilla frosting of all time. A little apprehensive to make a flour frosting, this turned out beautifully. No one would ever know it has flour or granulated sugar. Wonderful. That frosting sounds really interesting and I love how you decorated your cupcakes. This is why I love your blog, Julia. If I had read that recipe in a magazine I would never try it but knowing how great everything you make is, I'm sure this will be yummy too. I will be trying these cupcakes very soon! And thanks for the giveaway opportunity! These cupcakes look delicious. I will definitely try them for Halloween. YUM! These sound and look delicious! I would love to try the vanilla bean paste. Love your blog! These cupcake's look wonderful. Can they be made into a cake? If so what size pan would you use? I would love to make this into a cake. The Vanilla Sounds great! Welcome back! And that frosting recipe has piqued my interest. Thanks for hosting a giveaway! Can't beat good vanilla! This summer I purchased some vanilla bean paste and have been terrified to try it but alas I will put it front and center and give it a go. I so want to try vanilla bean paste! Glad you had an awesome trip! That does look like a keeper. I have to admit I am a sucker for a brown sugar anything ;) I will have to give that frosting a try too! Photos are gorgeous and glad you had a great vaca!! WOW! Does that look good! Can't wait to try the recipe. My blog is http://www.martinasmoments.blogspot.com. I tried making the flour based icing to put on some cupcakes. 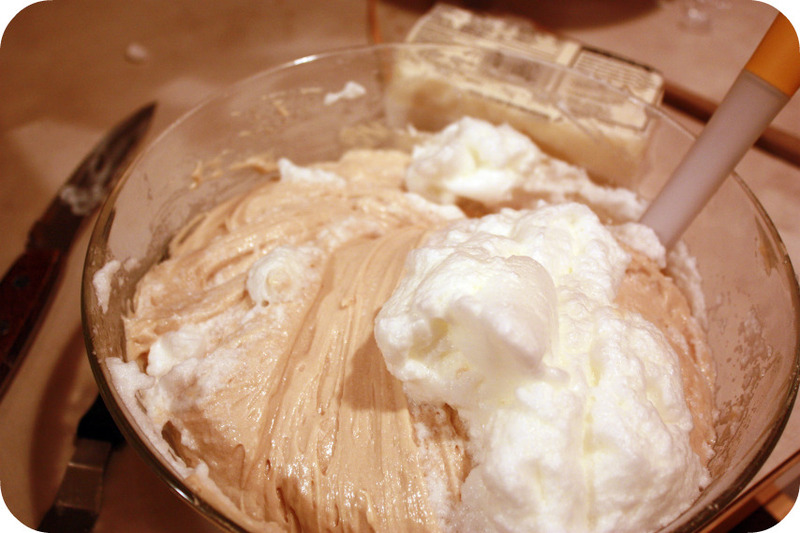 The icing has a whipped cream consistency and tastes a lot like the icing that you usually find on grocery store-bought cakes. I need to bake these cupcakes, they are beautifully decorated!